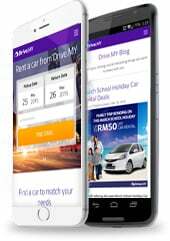 KMT Global Rent A Car S/B, our proud partner of Drive.MY! KMT Global Rent A Car & Tours specializes in car rental in Kota Kinabalu and provides tours to Kota Kinabalu and Sabah. Since 2005, our friendly and professional staff having been serving visitors to Sabah from all over the world. We pride ourselves in being are always ready to assist you during your stay in Kota Kinabalu, Sabah. We provide excellent customer service, giving great value for car rentals and tour services for you. No matter where you wish to go, we are prepared to help you get there, safely and in comfort. Our car rentals are second to none, in great condition, road worthy and comfortable. We understand the importance of safety and comfort, and promise to give you peace of mind while you are using our services. If you need a rental car during your stay in Sabah, on business or for a road trip during your vacation, feel free to contact us. We won’t keep you hanging. Everyone of us are committed to make sure you get what you want, when you want it and at a price that is more than fair. For car rebtals and tours throughout Kota Kinabalu, we have the perfect one for you. City cars, luxury cars and 4WD, to vans and coaches. We get there in comfort and safety. All our vehicles are top of the line and air-conditioned for your comfort.